Treat yourself to a relaxing spa treatment which has been crafted to help you unwind and enjoy the fabulous views overlooking Cardiff Bay. 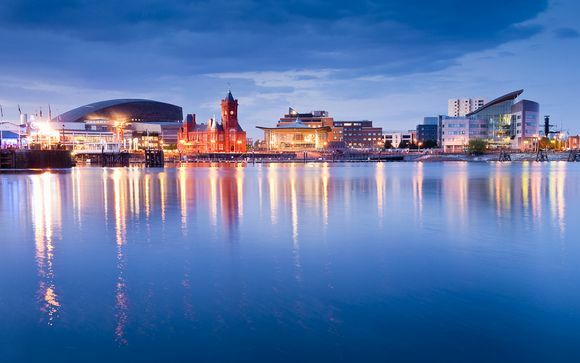 With a plethora or restaurants and bars just moments from the hotel and the vibrant Cardiff bay on your doorstep...you really are in the perfect place to explore the city. This hotel makes a bold statement on the waterfront, with its glass-fronted façade, private balconies, floor-to-ceiling windows, and iconic setting. Cardiff is a unique blend of ancient forts, quaint coffee shops housed within Georgian shopping pavilions & apologetically modern, architectural statements that dominate the rejuvenated waterfront. This city is the site of Europe's largest urban renewal scheme and its success can be seen throughout....the entire waterfront is buzzing mix of lively pubs & trendy music venues. A destination for relaxation, indulgence, and leisure on Cardiff Bay, The St. David’s Hotel is an acclaimed Cardiff hotel. Presented with a 2017 Gold Award by Visit Wales, the hotel makes a bold statement on the waterfront, with its glass-fronted façade, private balconies, floor-to-ceiling windows, and iconic setting. Just for you: Complimentary late check-out until 12pm. - Guest Room (31m² / max. 2 persons): Unwind in a room where your eye can't help but be drawn to your floor-to-ceiling windows with their panoramic views of Cardiff Bay. - Superior Room (31m² / max. 2 persons): With it's private balcony, fine Italian furnishings and marble bathroom, this room is an undeniable elegant space to retreat to. - Deluxe Room (31m² / max. 2 persons): These rooms feature all the charms of a Superior rooms with a whole host of extra amenities such as complimentary robes. - Junior Suite (40m² / max. 2 persons): Luxuriate in these spacious rooms where you will find a separate seating area and some of them even lead onto double balconies so you can soak up the views in comfort. - Master Suite (54m² / max. 2 persons): Discover your home away from home when you step into this suite with its fully furnished lounge area and large king-sized bed, made even more luxurious by your welcoming fruit bowl, bottle of wine & handmade chocolates! - Deluxe Master Suite (54m² / max. 2 persons): Pamper yourself with the prestigious Deluxe Master Suite, the epitome of elegance and luxury in Cardiff. The suite is exquisitely furnished, has a separate lounge / dining area with 2 x 32” plasma TVs and offers spectacular views from one of the 2 private balconies across Cardiff Bay...the perfect backdrop to your stay. The only AA-rated five-star hotel in the city, and close to BBC Wales, it has welcomed many celebrity guests including Benedict Cumberbatch, Martin Freeman, and Matt Smith. 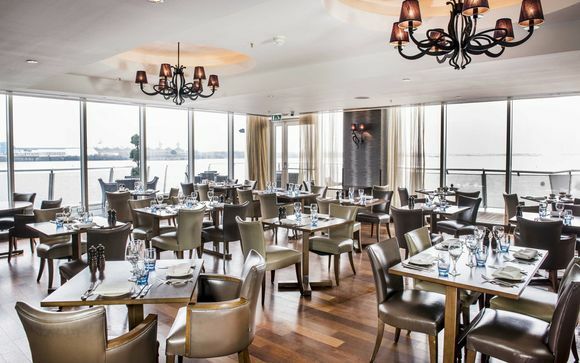 Indulge in a bit of sophistication overlooking the beautifully reinvigorated Cardiff Bay where the fair is simple yet tantalising, showcasing the best of Welsh cuisine & culture. Be it in the hotel's light-filled fine dining restaurant or its panoramic terrace, every inch of the menu has been carefully curated to make your stay a memorable one. 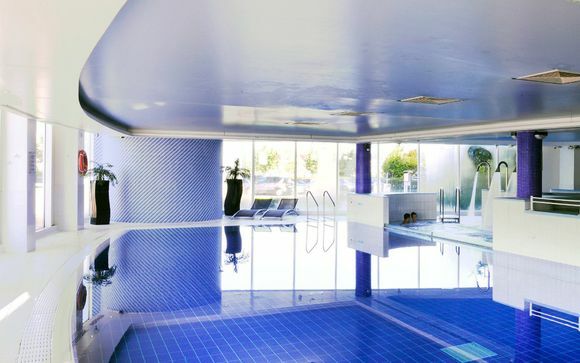 A coveted retreat in Cardiff, you’ll never regret an hour, day, or weekend at The Marine Spa, regularly ranked amongst the top five spas in the UK by Condé Nast Traveller. Whether you have an hour to de-stress or a whole day to completely unwind, it’s the perfect environment to relax in your surroundings and indulge in a little spa therapy right on the edge of Cardiff’s trendy waterfront. Your hotel is approximately 11min / 950m from Cardiff Bay Station.